Modern Farmhouse Style and Achieving the Look! Modern Farmhouse is almost a catch phrase these days. You might ask, "What style is your new home?" "It's going to be "modern farmhouse"." How do you define modern farmhouse style? In general, it's a calm, cozy, inviting look for your home which is very appealing to many people. Here's what you need to know on how to achieve the look. Neutral palette. Farmhouses are rarely ever bold in color or style. Neutral colors reign, with some splashes of color where desired. Overall walls, floors, and furniture should maintain a neutral hue in white, beiges, tans and greys. Texture. Farmhouses mix and match texture. Texture gives a room depth and interest. Cotton, canvas, wool, etc will give your senses plenty to touch and feel. A wonderful way to add both a neutral palette and texture is a jute rug. These natural color, natural fiber rugs offer a great foundation for the room. The Eva Jute Rug shown above has a wonderful fringe as well. Another one of our favorites rugs is the Morrocan Blair rug, also shown above. This is a popular rug, seen on many home decor blogs at a great price point. From living spaces to bedrooms, this rug is soft and plush. It doesn't shed either. Wood. A farm home is all about wood with some history and mixing and matching different types. Select a dining table with some uneven texture. I always think of how Joanna Gaines on Fixer Upper gets Clint Harp to make these wooden dining masterpieces for her clients' kitchens out of reclaimed wood. Here's one of my favorite recent homes she did in her signature modern farmhouse style. Vintage. Vintage pieces are a wonderful way to add authenticity to a modern farmhouse. A real farmhouse would have newer pieces and those that were passed down from other generations. A new soft plush soft would look great with a vintage side table, a vintage buffet or other type of antique. It's important to remember comfortable style is key with modern farmhouse. Finishes. Think wrought iron, black or bronze. These stand out so nicely on a neutral color palette as well. We have a handful of such light fixtures, such as the Harford 6 light Chandelier shown above. A ceiling fan we love is the Spitfire in matte greige with weathered wood blades, as shown above. This offers both that darker look finish with a really neat, textured looking wood blade. Simple accessories. A modern farmhouse doesn't overaccessorize, but simple practical accessories are common. Books, plants and mirrors add a lot of dimension. 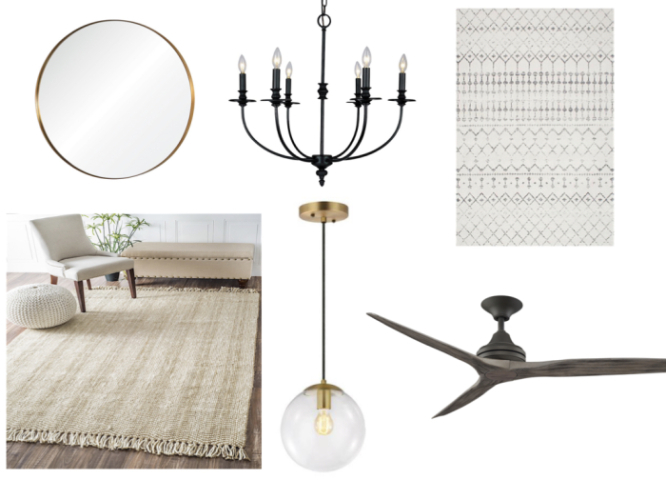 Our simple round mirror in antiqued bronze, shown above, is a wonderful simple accent in a modern farmhouse. Personalize your space. Don't forget to personalize the space to your taste and add personal touches keeping within the neutral, warm, inviting guidelines. It is nice to add something different and your own. That said, we picked the Marie Globe Pendant, above, as a nice choice to add to a modern farmhouse. It's clean and sleek, but adds a touch of glam with it's gold finish. At a fantastic price point, it's a great addition.